Per request, I'm posting the steps to utilize a good channel within an image. 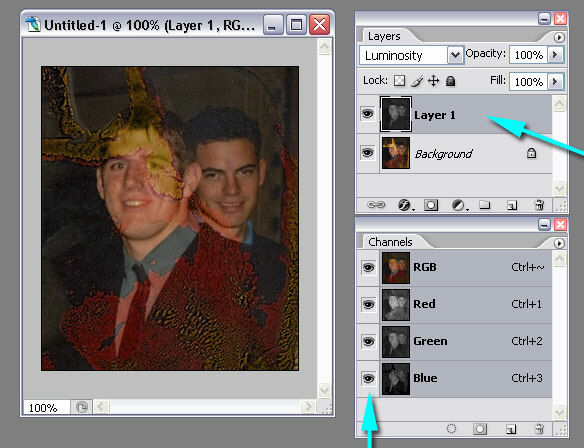 Have the LAYERS and CHANNEL palettes open next to your image. • Locate PREFERENCES on the MAIN MENU. • Select DISPLAY AND CURSORS and uncheck the box for "Display Color Channels in Color"
On the CHANNELS palette, click once on the layer you want to use. 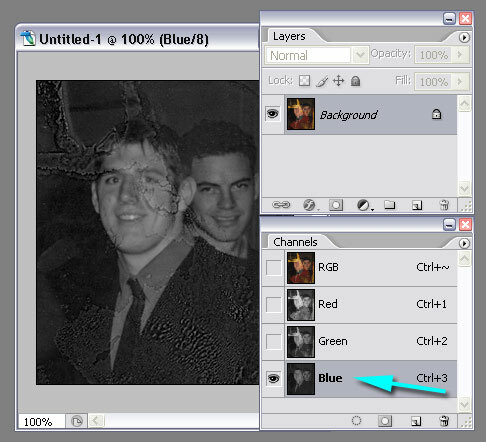 In this example, I'm going to select the BLUE channel as it has the most image information. From the MAIN MENU, choose "SELECT", then from that menu choose "ALL". You should see the "marching ants" around the border of your image indicating it's been selected. From the MAIN MENU, choose "EDIT", then from that menu choose "COPY". This step copies the channel to the clipboard. • Click once on the "RGB" channel in the CHANNELS palette. From the MAIN MENU, choose "EDIT', then from that menu choose "PASTE". 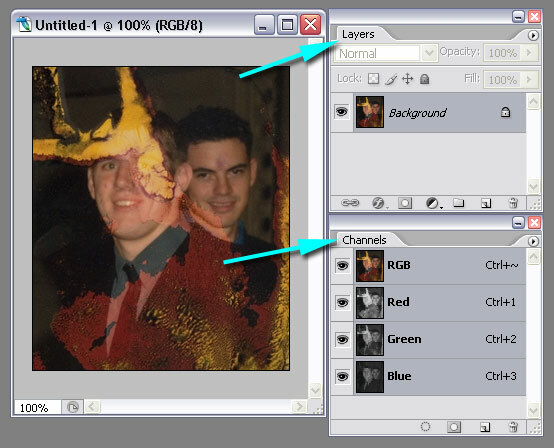 This step will paste the channel into a new layer in the LAYERS palette. • Set this new layer's OPACITY to "LUMINOSITY"
At this point you can see the "good" blue channel with the color from the original showing through. This is a much easier fix. For example, in the image below, I've added a transparent layer "layer 2", with it's OPACITY set to "Color". I used the eyedropper tool to select colors and then painted on the transparent layer. Now it's just a matter of cleaning up the smaller damaged areas. GREAT information. Thanks for posting it! Thank you Vicki. You're my hero on this picture! Your tutorial saved me once again. I am working on a non-OPR restoration, that is covered with orangish-red spots. 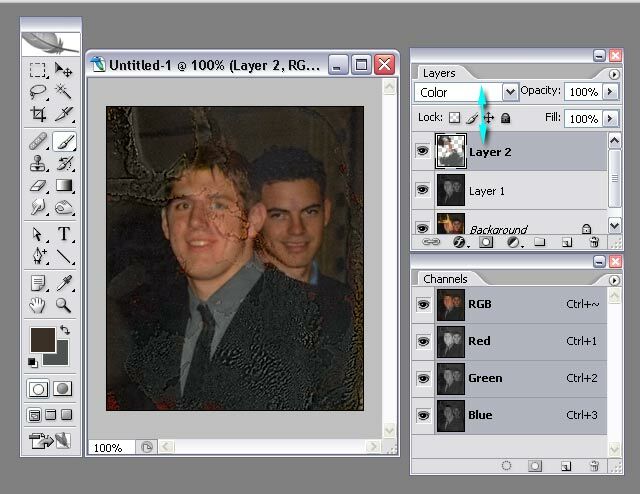 Your tutorial is working beautifully in repairing the photo. Thank you again for posting this tutorial for all of us at OPR. Just what I was searching for - thanks. I made a set of actions for all channels (RGB, L, CMYK). I will gladly send the .atn file to anyone that would like to have it. Richard, as a new volunteer, I would love to have the .atn files for this. It will make it so much easier! How shall I get you my email address? Just post it here? You can send him a personal message or an email. Click on his user name above his avatar and it will take you to that information. Thanks for doing the actions on the channels Richard. That will be a great time saver!